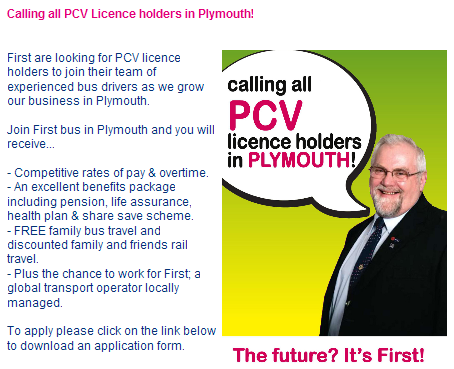 As has been well documented here, First have been cutting back on their routes in Plymouth with more cutbacks due to take affect shortly with reduced evening services on the 11 for example, so it is interesting that they are now calling for more drivers for Plymouth “as we grow our business in Plymouth”. Is this the start of the First response to the possible sale of Citybus? I had heard rumours but have now seen the registrations - more to follow tommorrow!